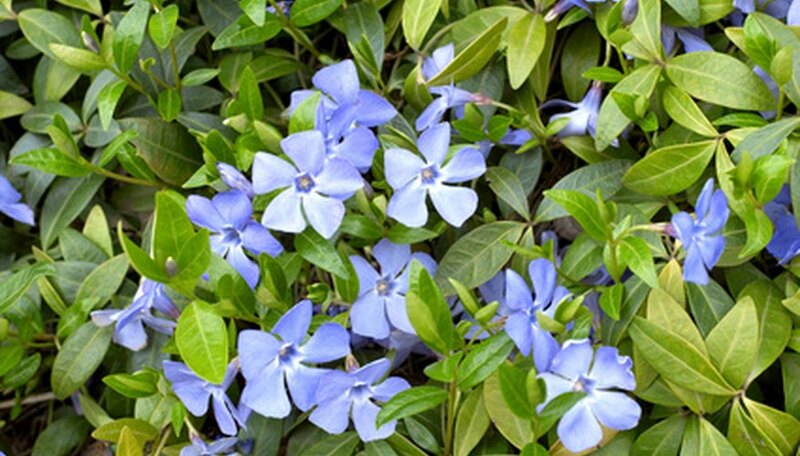 Two evergreen groundcover vines for the garden are the Asiatic jasmine (Trachelospermum asiaticum) and the common periwinkle (Vinca minor). Both grow in shady locales, but direct sunlight in a moist soil ensures that foliage density and flowering potential arehigh. Be careful about the spreading stems; prune them back each spring to keep the plants in bounds wherever in the landscape they grow. Asiatic jasmine grows in the woodlands of Korea and Japan where winters are not too cold. Vinca minor is native to Europe, southern Russia and the northern Caucausus. Many ornamental varieties of each species now exist, selected for their attractive leaf colors or flowers. Asiatic jasmine is a woody-stemmed, evergreen climbing vine. Oval, glossy dark green leaves line the stems that reach lengths up to 20 feet. In mid- to late summer, it develops small, fragrant white flowers that age to light yellow. Vinca minor grows long, trailing stems and shoots that remain somewhat soft or semi-woody. Its leaves are larger than those of the Asiatic jasmine and are a deep green. From late spring to late autumn or first frost, the periwinkle bears showy, five-petaled flowers ranging in color from blue-violet to sky blue or white. Plant Asiatic jasmine in mild winter regions, USDA Hardiness Zones 7 through 11, where winter low temperatures remain in the range between 0 to 40 degrees Fahrenheit. Asiatic jasmine survives better in protected locations where winds to not bombard the foliage. Common periwinkle is the better choice for colder winter regions, Zones 4 though 9 with winter minimum temperatures ranging from -30 to 20 degrees F.
While both plant species remain evergreen in the landscape, their flowering differentiates their appeal among gardeners. For example, if Asiatic jasmine is trained to grow its stems upright, flowering occurs and creates a nice visual and aromatic display. If allowed to remain prostrate and sprawl as a ground cover, the jasmine fails to flower and provides only leaf color or textural beauty. Vinca minor, while not fragrant, will flower for months; the large and highly visible blossoms add much to a garden bed. The long flowering season is most pronounced when the plants receive plenty of sunlight. Use Asiatic jasmine primarily as a ground cover in full sun to partially shaded locations. In hot summer regions more shade is recommended to maintain the best foliage. Water and fertilize it abundantly during spring and summer but water sparingly over fall and winter. Although it can be grown upright for flowers, a better choice for such an application is the related confederate jasmine (Trachelospermum jasminoides). Vinca minor prospers as a ground cover, too, to the point of growing so well on fertile, moist soils that it may become invasive. Use it to stabilize hillsides in full sun to partial shade. It will tend to survive and grow in all but the driest and most nutrient-poor soils. It can be troublesome to eradicate once it outgrows its original garden bed.